When people hear about BLW, they often ask « What is this? ». Well, it’s a new way of doing things. It’s a popular new technique and it’s also very interesting to see. I must say many people were impressed by it, but there were also a lot of people making judgements. I want to share my experience with BLW, but also teach you more about “ What’s BLW?”. BLW stands for «Baby led weaning ». It’s a new way to feed your baby. The main concept is to let your baby learn, by himself, how to eat. Which also means, you won’t be feeding your baby puree. We give the baby pieces of food then they will grab the food with their hands and then bring it to their mouth, all by themselves. The parent is totally excluded, in the sense that baby oversees every step. You want to give your baby the opportunity to get used to solid food from the beginning. Put it this way, with lots of practice, your baby will learn to crawl and to walk all by themselves. This is the fundamental idea behind BLW, your baby should also be able to learn how to eat by themselves. With this new technique, you will learn how to trust your baby, but also how to let go. With Téo, I never had to go through a transition period, from puree to solids. He first learned how to eat with solid food, food that we all eat. The traditional puree meal, requires the baby to evolve with time. From what I have seen and hear with my surroundings, I believe some parents hit many bumps in the road while trying to feed baby with puree. The baby doesn’t always understand how to interfere with the changes happening in his life. Which sometimes led to the baby refusing to eat. With BLW, you begin with solid food after that there is no evolution, which eliminate lots of stress on your baby. When Téo started BLW, it was so beautiful and impressive to see! 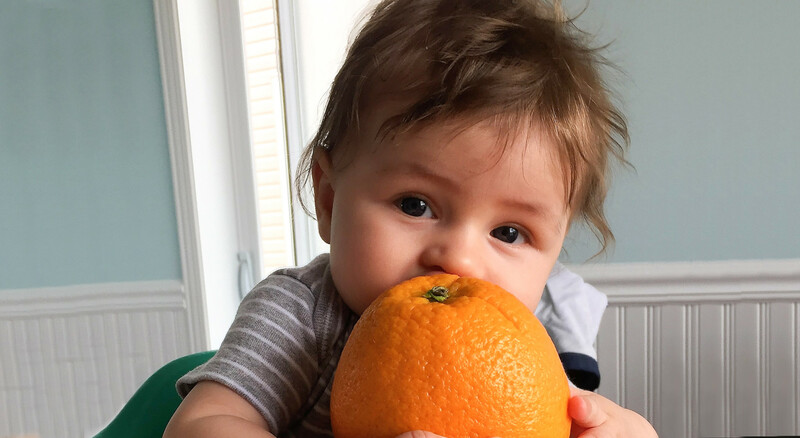 Our baby was 6 months and 1 week old, ready to eat, but mostly happy to discover all these flavors. My baby NEVER refused to eat. I never had to deal with him crying because he didn’t’ want a bite, because Téo was really in his element with BLW. With true pleasure, he was discovering, by himself, new textures, the warmth, the cold, how to pick up food and how to feed himself (that he understood pretty quickly ;)). Seeing him discovering all these new foods, touched me deeply. I can honestly say that I will be practicing BLW with my baby number 2. Something I find very important in our household, is being able to eat all together, with Téo. Gladly with BLW we can do so, very easily. We only have to drop a couple pieces of food in front of him and he takes care of the rest. During those meals, the baby gets a good example on how to hold their spoon, how to bring the food in their mouth, how to chew, etc. While you get to enjoy a meal surrounded by your family. BLW can be a little stressful from time to time. The first couple times you have no idea how the baby will react and approach the situation. You really have to learn to let go and trust your baby. Ultimately, that’s what raising a child, is all about; learning to let go. While being a reference for them and teaching them to the best of your knowledge. Once they grow older, while experiencing life, what will remain, will be the trust that you build while they were young. You also should learn to let go when it comes to BLW’s gag reflex. It’s a natural reflex, which happen when the baby doesn’t chew their food for a normal period of time and then swallow big chunks of food. The gag reflex, brings the food back to their mouth, allowing them to chew a little longer. It’s not vomit, it’s a natural reflex to avoid choking. This gag reflex also happens when you give your baby puree or when you start introducing solid food. The sound they make during while “gaging” can be a little bit weird, but you get used to it quickly, knowing what it’s for. It becomes less stressful. After a couple weeks, their gag reflex will fade away, since they will have learned how to chew properly. People think BLW makes quite a mess. In my case, it was far from being a problem. I read many articles to understand the many opinions on the subject and understand about the most practical way to feed the baby. Needless to say, I learn my many tricks. From day one of eating solids, at 6 months and 1 week, I dressed my baby with a long sleeve bib for every meal, like this one (a bib usually used to paint with). I never had to change him after a meal. All I had to do was rinse the bib and hang it to dry for the next meal. My other trick is to put a table cloth on the floor when he eats. This way, if he feels like throwing food on the floor, I am covered ;). The food that gets dropped on the table cloth can also be reused as it’s on a clean cloth, not a dirty floor! I personally prefer to only give him a couple chunk at a time, this way I control a little bit more the food that could potentially end up on the floor. Every baby is different, Téo never felt like playing with his food or even cover his hair with food, let’s say he kept it classy and clean! We often forget, even though you baby start by eating puree, one day he will have to learn how to grab food and how to eat by himself. It’s only a question of days until foods end up on your floor! In our home, it’s very important to take the time to sit down and enjoy a good meal. It’s far from being different now that baby Téo has entered our lives. Our meals last about the same time. It’s important for us, that our baby eats with us. This way we can keep an eye on him at all time. No matter what kind of food or how old your baby is, a child should never be left alone to eat under the age of 6. As I was mentioning, this is based on my experience. If you would like to practice BLW with your baby. I highly recommend you to read more on the subject, to understand the concept, but also to know the main principle.